We learned a couple of things about Christmas Tree Lights this year. So in this brief, uh, tutorial, we're passing on the two tips we wish we had known years ago. First, of all, the best way to photograph Christmas Tree Lights is before you put them on the tree. Our test photo, conducted at a secret facility near our international headquarters using an iPhone 6 Plus and edited in Exposure X, proves the point. Christmas Tree Lights. Best photographed off the tree. Every color is gleaming, none of the bulbs are burned out and the green wires are neatly bundled. That's our Christmas card next year, no question. The other tip explained to us why half our strings went dead one year. 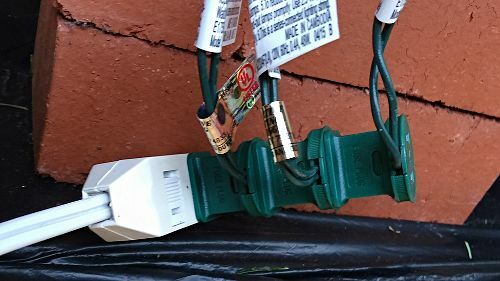 You can plug a second string into the end of a first string of lights, no problem. But some strings can't handle more than that. The current required by the lights burns out the flimsy little wires running the length of the string. That happened to us when we strung four together one year to make a taller tree happy. Piggyback Them. To avoid damaging the strings. 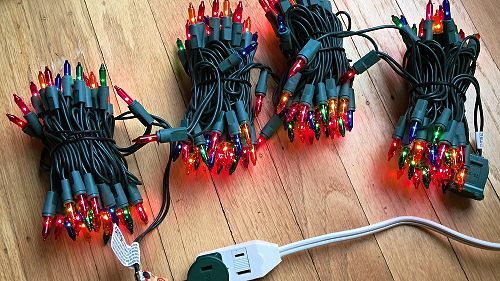 The trick is to plug each string into the extension cord. You can piggyback the plugs onto each other, which just passes the juice through to the next string without overheating the wires.